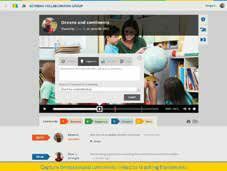 Edthena is an online video observation and collaboration tool for teachers. Quality and Effectiveness: Research says that teachers improve when they watch themselves or other teachers through online collaboration. Edthena makes it easy for educators to do just that and brings PD to the next level. With Edthena, teachers and coaches can record themselves when the opportunity arises and comment on and discuss lessons any time, at their own convenience, without having to find a time to meet. They can also create or join groups for video conversations and meet virtually to share lessons or coordinate curriculum. The videos can be used to drive teacher learning with specific feedback, analysis, and suggestions linked to particular segments of a lesson. Ease of Use: The home page, with thumbnails of all available videos, is easy to navigate. Other useful features include printing and export features. As a video runs, teachers and coaches can click to add time-stamped comments, using one of the color-coded icons: question, suggestion, strength, or note. Also, it’s easy to access supporting documents like lesson plans and worksheets. Program help is available at all times and includes step-by-step instructions, articles, and support tickets. Creative Use of Technology: Edthena uses technology to empower teachers to drive their own learning and to make the PD process easier, more effective, and less time-consuming. Edthena users can also access the complete library of METX videos, which includes more than 2,100 recorded lessons. The library features three videos of every lesson: a front view of the board, a wide-angle view of the room, and a split-screen view so that observers can focus on different aspects of the classroom experience. Suitability for Use in a School Environment: The cloud-based program is easily integrated into the school environment so that everyone can access the program and videos at their convenience. Edthena is compatible with all systems—Windows, Mac OS X, iPhone, or iPad. With the iOS app, users can upload videos directly from a mobile device (which is not an option in many programs). Teachers can share lessons with evaluators and print information from the program in PDF format. With Edthena, schools and districts can implement video in many scenarios, from new teacher induction to teacher mentoring, PLCs, and peer observations. Districts can use leveled indicators to show group levels over time (graphs, baselines). Interactive dashboards can also track teacher growth over time. ● Videos can be matched with associated documents such as lesson plans and worksheets for instant evidence.